[PRESS RELEASE] Boulder, Colorado – August 30th 2012 – Twisted Pine Brewing Company has embraced and utilized this year’s monthly Artisan Ale Project by crafting an array of bold beauties such as Canis Lupulus (an Imperial Black IPA), Sacred Spice Chai Porter, West Bound Braggot (silver medal winner at this year’s Colorado State Fair), Black Swan (a black saison), and Wagon Wheel Stout (aged on cherries over a year in bourbon barrels). September finds the brewers once again flexing their flexibility as they present the Big Sticke (pronounced “Schtick-uh”). The style known as Sticke Altbier originated and is still brewed seasonally in small quantities in Düsseldorf. The story goes that Sticke (meaning “secret” in the regional German dialect) began as a brewer’s mistake batch, likely the result of extra malted grains accidentally finding their way into the mash. This fortuitously stronger version of the local Altbier was tasted and relished and soon gained the admiration of the townspeople. The ‘secret’ recipe passed in whispers through the ears of several neighboring brewers and a tradition was born. A few breweries from the region, such as Uerige and Schumacher, continue to release their Stickebiers biannually, once towards the end of Summer and again in the wintertime. Twisted Pine’s homage to the seasonal style is colored somewhere between crimson and copper under an enticing almond head. Subdued sweetness with a dash of black pepper aroma drift from glass to nose, revealing the Vienna malt which comprises the majority of the recipe’s grain bill along with the Saaz hops steeped in the beer after fermentation. Big Sticke hits the tongue with a rush of smooth, malty goodness rounded off by crisp, savory notes provided by the German hops, Magnum and Perle. The flavor is balanced with finesse and despite weighing in at 7.1% ABV and 71 IBU, is extremely gentle on the palate. The label for Big Sticke features a piece by local artist Jennifer Mosquera, entitled “Fall Acrylic on Wood Panel”. Jennifer’s artwork will be on display throughout the taproom during the release party, which runs from noon to 9pm on Saturday September 1st, and she will be on hand to personally sign bottles. The artwork will remain on the walls for the rest of the month and the beer, in 750ml bottles and on draft, will be available at Twisted Pine’s ale house while supplies last. 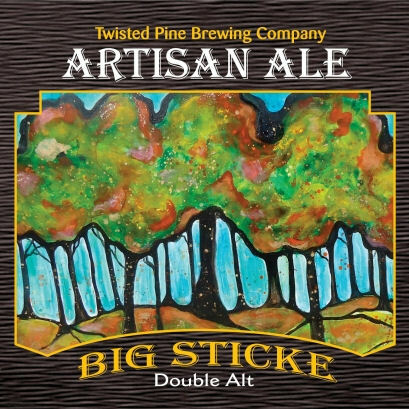 In addition, a few select local accounts will have bottles and draft of the very limited Big Sticke. 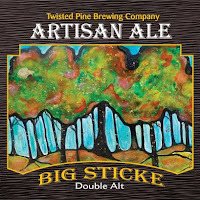 For more information about the brewery and its Artisan Ale Project, visit www.twistedpinebrewing.com. - Twisted Pine Taps the Root.